Can a movie where the plot revolves around whether or not to negotiate a peaceful end to hostilities between the UK and Nazi Germany during World War II be dramatic and interesting enough to carry a two hour movie? In the case of Darkest Hour the answer is a resounding, "Yes!" 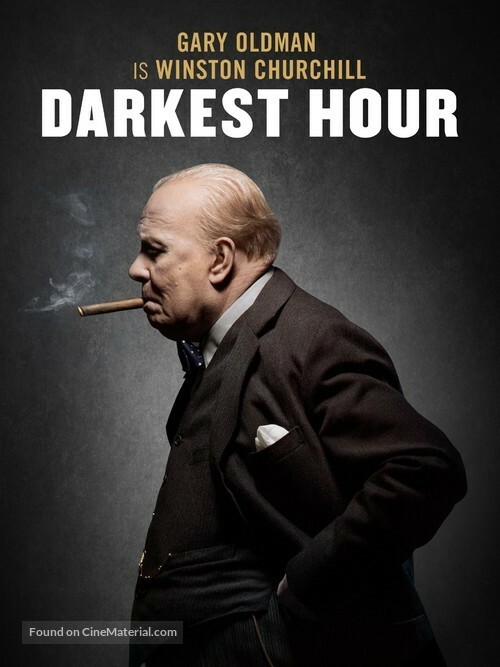 Gary Oldman is superlative as Winston Churchill. The movie relies on his performance to succeed, and he delivers the performance of his life. Not to downplay the quality of the rest of the cast, but Oldman carries the movie as he is in almost every scene. While his performance does occasionally exaggerate Churchill as a doddering old man, those instances occur in the first half of the movie, and by the final third of the film Churchill is portrayed as having all of his faculties intact. The final act is especially effective and shows a Churchill who is determined, clear headed, and more clever than his political opponents (his predecessor, Neville Chamberlain and Edward Wood, the Earl of Halifax - aka Viscount Halifax). Churchill faces a crisis immediately upon becoming Prime Minister. The British Army - virtually the entire British Army - is surrounded by Nazi forces in France and they are threatened with imminent defeat. Chamberlain and Halifax, both of whom Churchill puts in his War Cabinet, insist that Great Britain must enter into peace talks with Germany using the Italians as mediators. It was Chamberlain who had foolishly believed Hitler previously, and had his Non Aggression Pact with Germany treated like old newspaper by the Nazis. Chamberlain still believes that Great Britain's only hope for survival is through a negotiated peace, and Halifax strongly agrees with him. Churchill, however, knows what kind of man Hitler is, and what kind of people he has around him. Thus, the battle of wits and wills is on between Churchill and his political opponents who happen to be in his War Cabinet. Knowing how that battle turns out (this part of history is well known - the British would, "Never surrender") doesn't greatly lessen the impact of how Churchill goes about winning support for his strategies. That is the part of the story that isn't as well known, and it makes for some compelling drama. The direction by Joe Wright is also fairly spectacular, with some very nice visuals and a sense of flair and style that is perfect for the movie. It's not overly flashy or showy, but it's not stiff and stilted, either. His handling of the actors is excellent, and his handling of the visuals is just as good. In the end, this is a movie that tells a story that, like those of Saving Private Ryan and Schindler's List, needed to be told. And it was told well.